Dependence—I receive a stipend from overseas for the work I do. Dignity—I alone can do the work in a manner worthy of the Almighty. Doctrine—I trust my doctrines but remain unsure about yours. Economics—I meet my needs from offerings, so must get them all. Education—I alone have enough knowledge to teach the Bible aright. Egocentrism—I desire that all group members look to me instruction. Gifting—I am the only one in my network, who is gifted to lead. Ignorance—I do this work in the only way that I have been taught. Inheritance – I inherited this role from my father who led everything. Legality—I am not legally allowed to delegate my religious authority. Megalomania—I relish laud, praise, glory or respect from others. Modelling – I follow the model that foreigners showed us. ?Normalcy – This is the only pattern that I have experienced. Paternity—I regard believers as my children and they me as their father. Patronage—I am the only one to whom everyone looks to protect them. Perfection—I maintain the sinless state that leadership requires. Persecution—I ensure that every group remains hidden from authorities. Priesthood—I alone am authorized to baptise and to serve the Lord supper. Privilege—I alone have a social status that allows me to lead. Recreation—I enjoy my work so much, that I do not want to lose it. Unification—I keep unity between the gatherings by my personal presence. In all cases, you must guide pastors to work out their own plans to raise up lay shepherds in every generation of churches and gatherings. 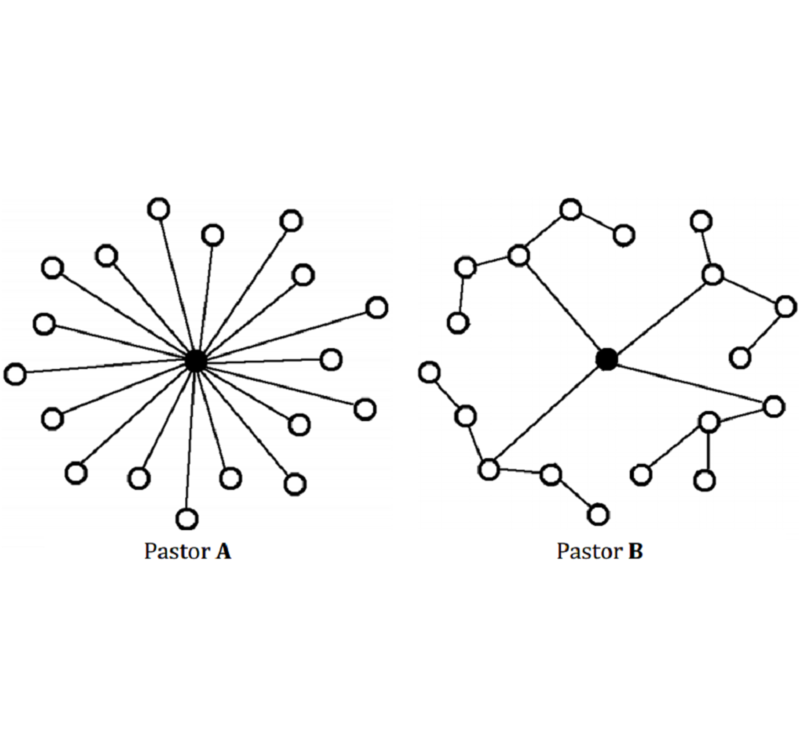 In the image above this article, which pastor, A or B, cares for more gatherings? Which pastor has time and energy for his family, fields and ministry?